Let me start by disclaiming a few things. One, I am not advocating you upgrade. Two, this article is meant to help make your upgrade easier and safer should you decide to do it one day. Three, I happen to have spare boxes used for testing, so I can sacrifice them should there be a need. Four, this article isn’t the upgrade process itself, which we will have separately very shortly, this one is all and only about the preparation steps for the upgrade. Sounds complicated? It is. Anyhow, if you’ve followed the news lately, then you know Microsoft has created a tool called GWX designed to allow you to request a free upgrade to Windows 10. They did it in a very silly manner, hence my awesome guide on how to get rid of the nonsense. Finally, there are superior ways to upgrade, and we will discuss them here. Overall, if you ask me, Windows 10 is nothing special. Not good, not bad, just ok, and certainly not a game changer if you’re using an existing version of Windows. Yes, it might seem like it’s awesome compared to Windows 8, but deep down, it’s fundamentally the same product, with a higher number. XP and 7 were (are) just too good for their sake. This means that you will wait, and then Windows 10 will land on your box, and then you will start the upgrade. It might work, and if not, you’ll probably be in a very bad shape. Then, I have no idea what could happen to your data, so we will discuss this separately, but it’s always prudent to keep system images and have a proper backup strategy in place. You might want to consider a different approach. In-vivo upgrades are always tricky. However, for me, Microsoft has always had a spotless history when it comes to service pack upgrades, and they did it way better than say Ubuntu and friends, although there’s been a huge amount of progress in this space. Then, installing a completely new operating system can be a daunting task. Which is why you want to have some reassurances before you start. The best way to go about upgrades is to actually download the Windows 10 ISO. Yup, that’s right. Microsoft has actually created a tool that will customize and download the ISO for you, or better yet, upgrade your existing system. It’s basically what GWX will do, except you have no silly icons, no wait time, no nonsense. The first time you launch the program, it will ask you if you want to upgrade the existing computer or create the installation media. We want the latter for now. Then, you need to choose the language, the architecture, and most importantly, the version you want to upgrade. Microsoft only promises free upgrades for the existing like-to-like versions, like Home to Home, so you need to choose carefully. The question is, do you know which version of Windows you’re running? For Windows 7, the identification is pretty easy. For Windows 8 and 8.1 users, the task can be a little more difficult, especially since in the system properties window, you will probably only see a generic label titled Windows 8 or such. There are many ways to get the right info, including commands like systeminfo in the command prompt. Still does not give us quite what we need. To make this information meaningful, you will need to convert the two numbers to hexadecimal, then consult the necessary guides online as outlined in the guide above. 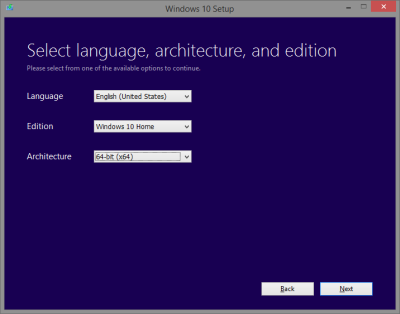 In my case, this translates into Windows 8.1 Home Edition, multiple languages. It also happens to be an OEM install, so the serial number is not transferable, and I can only install on the same host. A horrible way of getting the right information, isn’t it? Now, you need to decide if you want to burn the image directly to a USB drive or create an ISO file for the use on DVD media. Either one should work fine. Depending on your connection, the next step will take some time. The end result is a 3.5GB ISO. The product key? Remember my article on this topic? Basically, you should grab Nirsoft ProduKey, and then use it to retrieve your serial before you commence the upgrade. This should guarantee less pain. After that, we have the upgrade itself, but that’s a different story altogether. This article is all about what happens before the upgrade. I still have not decided how to go about this experiment. I should probably do it the hard way, with GWX, so I can actually see how this thing works, and it will reflect the experience most people seek. Then, on the other hand, I might as well use the media tool to get underway without any waiting. Regardless, I will come back in a few days with a detailed report on my progress, success or lack thereof. Then, should things work out fine, we will do some Windows 10 privacy and security tweaks, as this also seems to be a hop topic. Either way, I will help you get what you need, without all the drama, fuss or fearmongering. Take care.